Check this: I found an Easter activity that a) appeased my inner (and outer, named J) environmentalist; b) rightly celebrated the colorful fertility of spring; c) was appropriately eggy; and d) was ultimately delicious! In point of fact, it was a baker’s dozen. 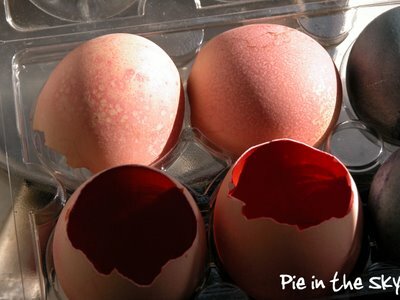 We cracked them by tapping the skinny ends of them against the floor (where we were sitting, and working on newspaper) until little cracks formed; then we gently chipped away at the hole until the top quarter of the eggshell was gone. They looked like little birds had wriggled their way out! We poured the insides out, separating whites and yolks and putting them in separate bowls, which we refrigerated. My first soufflé, ladies and gentlemen. I didn’t have a soufflé dish, and after sending J out on an unsuccessful venture to acquire one, I gave into my own disreputable creativity and built one out of a small stewpot and aluminum foil. It worked quite well! The perfect Easter food: we used the separated yolks and whites from our eggs to make the soufflé. Melt butter in heavy large saucepan over medium heat. Add flour, cayenne pepper and nutmeg. 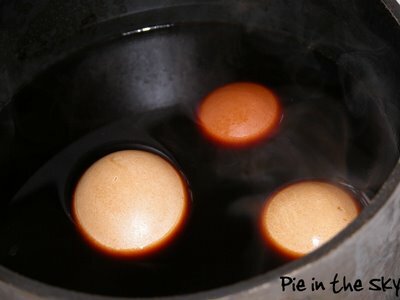 Cook without browning until mixture begins to bubble, whisking constantly, about 1 minute. Gradually whisk in milk, then wine. Cook until smooth, thick and beginning to boil, whisking constantly, about 2 minutes. Remove from heat. Mix yolks, salt and pepper in small bowl. Add yolk mixture all at once to sauce and whisk quickly to blend. Fold in 1 1/4 cups Gruyère cheese and 1/4 cup Parmesan cheese (cheeses do not need to melt). Using electric mixer, beat whites in large bowl until stiff but not dry. Fold 1/4 of whites into lukewarm soufflé base to lighten. Fold in remaining whites. Transfer soufflé mixture to prepared dish. Sprinkle with remaining 2 tablespoons Gruyère cheese. Place soufflé in oven; reduce heat to 375°F. 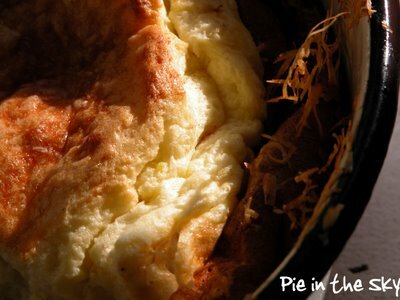 Bake soufflé until puffed, golden and gently set in center, about 40 minutes for large soufflé (or 25 minutes for small soufflés). 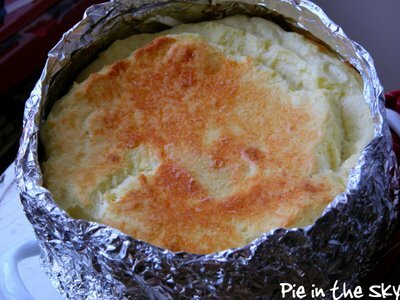 Using oven mitts, transfer soufflé to platter and serve immediately. We prepared the soufflé exactly as directed and it was a smashing success. The cayenne and nutmeg are clever additions that add a lot of flavor and experience to the dish. The soufflé rose into but did not exceed the limits of my aluminum makeshift dish; nor did it spill! I whipped up some whole wheat pancakes and topped them with fresh strawberries, pure maple syrup, and mascarpone cream; we ate them with the soufflé. Combine all ingredients and mix well. Heat two additional teaspoons oil on griddle or heavy skillet over medium heat; pour batter into pancakes of desired size, tilting pan to spread batter around. When batter begins to bubble, flip pancake; cook one more minute. Transfer to plate, garnish with mascarpone cream and syrup, and serve hot. 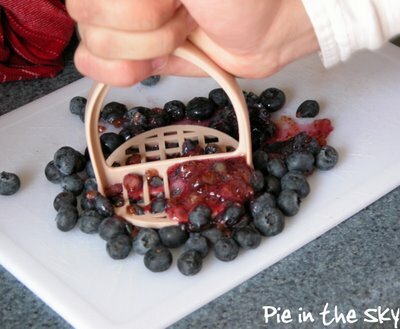 Blend all ingredients with an electric mixer for 2 minutes or until thick and fluffy. We removed the nicely dyed eggs and allowed them to dry. 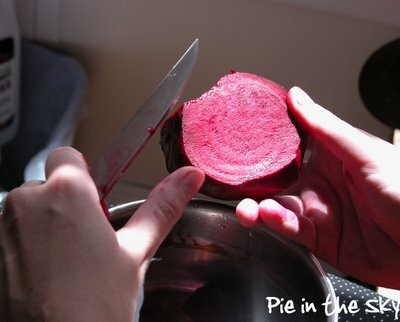 The beet (it was just one big beet) was the least potent of the dyes; it just left the eggs a little pink and spotty. The blueberries, on the other hand, were a great success, and the coffee eggs were lovely. Look at them all together! For the final part of our project, we went out to the park to soak up some sun and music. We filled each egg with organic potting soil, then planted herbs and veggies in each of them. Our egg-pots contain oregano, lavender, arugula, sage, cucumbers, and parsley! 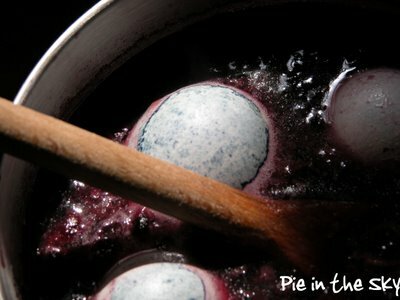 Placing a ball of cotton in the bottom of each egg will help soak up excess water and prevent molding. When the plants begin to outgrow their pots, just crack the eggs and drop them in a bigger pot, shells and all—the nutrients in egg shells are good for plants, and the shells help aerate the soil. Further updates to come when the little guys begin to sprout! That is SO cool. I am egg-envious. Needless to say though, if a chicken was downwind from your house, they would live in fear of your egg-stravaganza! gorgeous souffle, well done! Wow, what a vibrant Easter! This pictoral journey definitely enhanced the story you told me via phone. Everything about that is gorgeous. 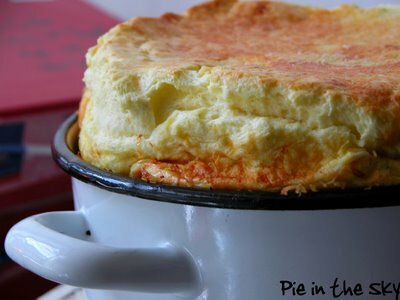 The eggs ... the souffle ... everything! I hope you had a beautiful spring day in New York! OK. THAT is extremely cool. Sustainable souffles. :) It also looks incredibly yummy, btw. 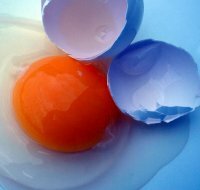 An egg-ceedingly, egg-cellent blog! You egg-emplified the egg-traordianary gifts of Spring and the egg-citment of Easter! Wow, doing that--any of it!--would never have occurred to me, but it makes perfect sense. Beautiful and functional. you missed one one of the word plays - eggs-strav-egg-anza. 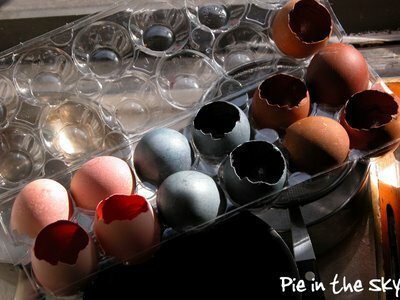 so pretty - i asked j if he remembered doing natural egg dyes here but he remembers nothing pre-ny! i never tried blueberry - good idea - and onion skins give a lovely gold color but also imparts a bit of flavor to the eggs so is good in savory dishes and egg salad. i love the way you tie entertainment and cooking and gardening together. You've inspired me Kate! 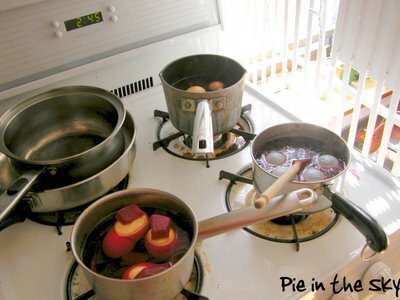 I hope to do this (the natural dyes and planters if not the souffle!) next Easter. Thanks for contributing to Cooking for Children 1: Easter Treats! Neat. 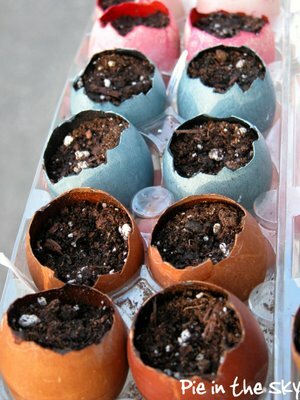 I've seen ceramic pre-seeded eggs (Egglings) but not homemade egg planters. Is there some sort of benefit to planting seedlings in an eggshell or is it more for the cute presentation? Though the cute presentation is definitely a perk, I had several more environmentally-minded reasons for my eggshell planting. 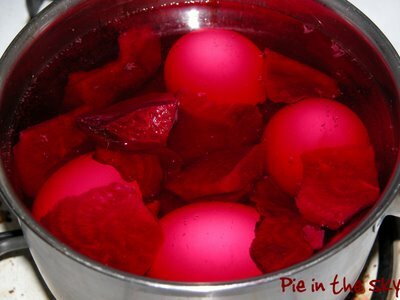 First of all, it was Easter and I would be dyeing eggs anyway, so rather than use chemical dyes and then probably eventually throw them away, I put both yolks/whites (in the souffle) and shells to use. Secondly, eggshells help aerate soil and are also chock-full of calcium and other nutrients that will get absorbed by leafy greens. And lastly, using biodegradable organic material to cultivate seedlings is way better for the environment than those little plastic crates! I've seen the ceramic eggshells...but why would you buy the ceramic ones (which are probably chemically bleached white) when you could use the real thing for free? Especially because almost all plants will need more rootspace than an egg offers and will have to be transplated eventually...so you can't even reuse the ceramic--you break it off and throw it away.